Published: Jan. 28, 2013 at 01:44 p.m. Updated: Jan. 28, 2013 at 09:37 p.m.
A poll of 300 NFL players found that most of them disapprove of Roger Goodell's job performance. NFL Commissioner Roger Goodell is not widely beloved by NFL players. This can hardly be a surprise following the lockout in 2011 and the New Orleans Saints BountyGate scandal last year. Now, we've got some numbers to back up the conventional wisdom. 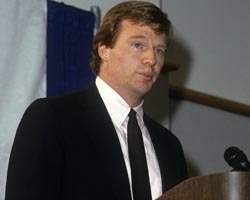 Take a look at photos of Roger Goodell through the years. USA Today polled 300 NFL players, looking for an approval rating -- and 61 percent of the players disapproved of Goodell's job performance, with the negatives focusing on increased fines for defenseless hits and the Saints' bounty scandal. "It's obvious that I disapprove," Pittsburgh Steelers linebacker James Harrison said of how Goodell has performed on the job. "I feel like what he's doing is not totally for the safety of players. ... A lot of stuff they've done, (such as) fining guys crazy amounts of money for helmet-to-helmet hits and all that and saying you're doing this for the safety of players. But yet you want to add extra games to the regular season." Kansas City Chiefs defensive tackle Shaun Smith also isn't enamored with Goodell. "I miss Paul Tagliabue. The league has changed," Smith said. "Bountygate was all 'he-said, she-said' stuff." Other players mentioned the officiating during the referee lockout as a negative for Goodell. But a surprising amount of players -- 39 percent -- believed Goodell was doing a good job. "If you're appeasing everybody, you might not be doing the job well," Dallas Cowboys quarterback Tony Romo said. "I know there are a lot of guys who think (Goodell is) abusing his power, but we kind of let him," Cowboys linebacker Brady Poppinga said. "I think it's on us to curb how much power he has in wielding punishments." We're not sure what conclusions to draw from the poll. Would approval be much higher a few years ago? Was Tagliabue particularly popular when he was in charge? It's hard to say without having numbers from previous years. Popularity with players isn't the ultimate goal for Goodell, as some players pointed out. Goodell's approval rating among NFL owners, his bosses, could well be in the triple digits. UPDATE: Fans got their opportunity to express their opinions to Goodell during a Monday afternoon chat on Reddit.com. During the Q&A, Goodell touched on a number of topics, including how he felt there was an "improved quality" to this year's Pro Bowl.